The end punctuation marks, for example, are easy to remember, distinguish and use correctly. The colon, semi-colon, dashes and hyphens and several others can be a bit more complicated. What every English teacher or student needs is a master diagram or graphic of how to use each one of those sometimes pesky symbols. And I just happen to have one right here - http://editorial.designtaxi.com/news-punct1606/big.jpg. Yes, take a good look at this chart and you will see all 15 English punctuation marks arranged in order of difficulty. I would encourage you to enlarge it, print it out and post it in a prominent and public place. 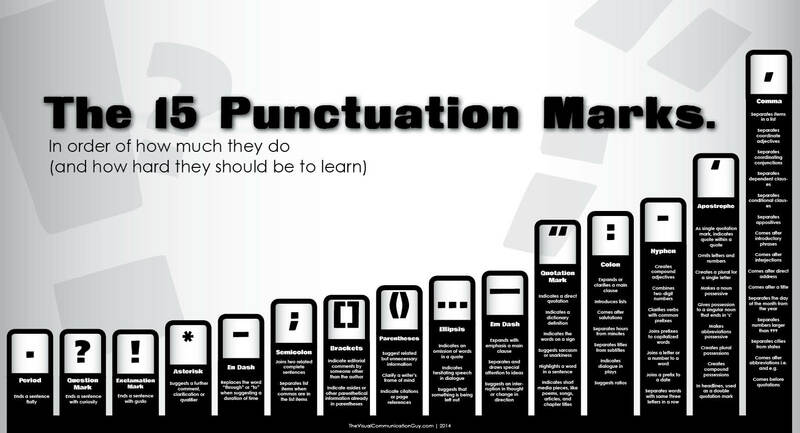 Here is the link to the PDF to print out - http://thevisualcommunicationguy.com/wp-content/uploads/2014/06/Infographic_Punctuation.pdf. Punctuation, like every other element of language, just takes practice and attention to master. Keep this punctuation chart close by and you should have no problem with this particular aspect of English. Let me know what areas of English puzzle you.